WHAT IS THE GHO HOMES DESIGN STUDIO? The GHO Homes Design Studio conveniently showcases all your choices under one roof. It's where you can really see the Tailor Made difference. You will have your very own design consultant, who will be available to provide guidance and advice to help you achieve your desired design style on your preferred budget. You will decide which features are most important to you, and we will help you create your very own personalized Tailor Made home. WHAT BRAND NAMES DOES THE GHO HOMES DESIGN STUDIO CARRY? GHO Homes has partnered with trusted national brands to bring you high quality and value. Mohawk® and Anderson® flooring, Sherwin-Williams® paint, Moen® faucets, Progress Lighting®, Caesarstone® quartz countertops, Aristokraft® and Kitchen Craft® cabinets, and GE® appliances are just some of the reputable products you will find in the studio. WHAT KINDS OF CHOICES WILL I FIND AT THE GHO HOMES DESIGN STUDIO? 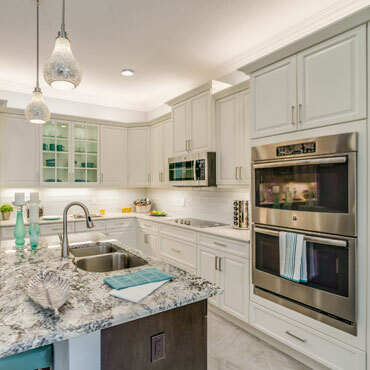 You will be able to select flooring, countertops, cabinets, lighting, appliances, window coverings and more. We offer a wide range of choices allowing you to personalize your home and make it uniquely yours. DO I NEED AN APPOINTMENT TO VISIT THE GHO HOMES DESIGN STUDIO? Yes. In order to give you enough time and personal attention, we do require appointments when working with your design consultant. Typically, you will have multiple appointments, generally one longer appointment (2–4 hours) to narrow down your choices, and a shorter appointment (1–2 hours) to finalize your personal selections. More appointments may be necessary for you to decide exactly how you want to design your new home. WHAT HAPPENS WHEN I VISIT THE GHO HOMES DESIGN STUDIO? Your design consultant will be there to help you navigate the process of selecting finishes based on your personal style, define your personal vision of your Tailor Made home and work within your desired budget. The appointments will be interactive, exciting and fun. HOW DO I PREPARE FOR MY GHO HOMES DESIGN STUDIO APPOINTMENT? First, think about how you will live in each room. Walk mentally through each space and make a list of the details that will affect your lifestyle including furniture placement, lighting, and medical concerns such as allergies and handicap needs. Next, you may want to utilize home design websites such as Houzz.com. Collect photos or anything that will help you and your design consultant define your style. Bring in magazine clippings and fabric and paint swatches if you like. Lastly, if you have children, you may want to arrange for a babysitter. Often, homebuyers prefer to give their undivided attention to these appointments, and we know how difficult it is for little ones to be so patient. HOW WILL MY CHOICES AFFECT THE COST OF MY NEW HOME? That is the true value of creating a Tailor Made home. You pay only for the selections you deem important enough to include in your new home. There are also many no-cost choices, and all prices include tax, delivery, installation and warranty. WHEN DO MY SELECTIONS NEED TO BE COMPLETE? After signing a contract with your GHO salesperson, you will have 21 days to finalize and sign off on your Design Studio selections. In our experience we have found this time frame to be ample enough for selections to be made with confidence. If circumstances do not allow this time frame to be met, you may make acceptable arrangements with your salesperson. DO I NEED TO GIVE ANY ADDITIONAL MONEY TOWARDS MY SELECTED OPTIONS? Our deposit schedule is a percentage based on the purchase price of your home. You will not be required to pay any additional money when you meet with your Design Consultant. However, the amount of your subsequent deposits will be based on the total purchase price of your home, which will include your selected Design Studio options. I VISITED THE DESIGN CENTER BEFORE THE REMODEL. HOW CAN I VIEW THE OLD PHOTOS? To view previous photos of our Design Center, click here.